This edited volume addresses the important issue of negotiating with terrorists, and offers recommendations for best practice and processes. Hostage negotiation is the process of trying to align two often completely polarised parties. Authorities view hostage taking as unacceptable demands made by unacceptable means. However terrorists view their actions as completely justified, even on moral and religious grounds. If they are to try and reconcile these two sides, it is essential for hostage negotiators to understand terrorist culture, the hostage takers’ profiles, their personality, their view of the world and also the authorities, their values and their framing of the problem raised by the taking of hostages. 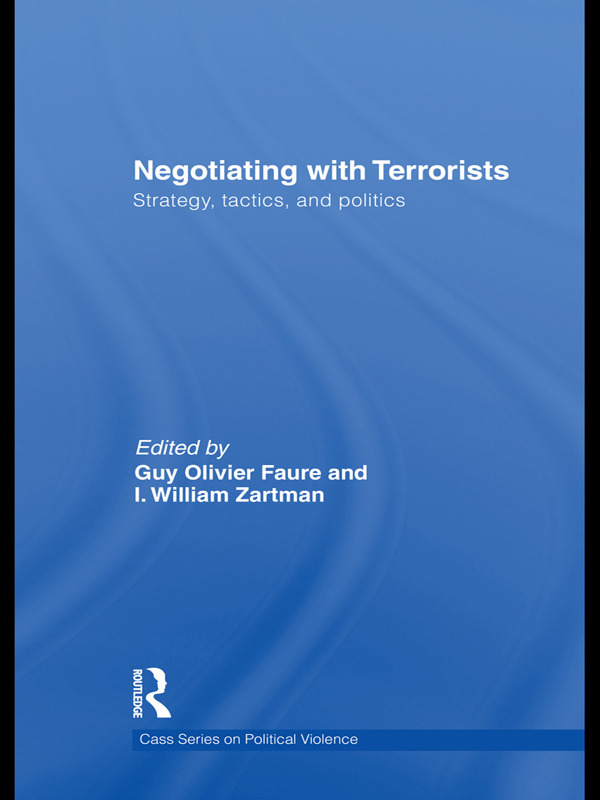 Although not advocating negotiating with terrorists, the volume seeks to analyse when, why, and how it is done. Part I deals with the theory and quantifiable data produced from analysis of hostage situations, while Part II explores several high profile case studies and the lessons that can be learnt from them. This volume will be of great interest to students of terrorism studies, conflict management, negotiation, security studies and IR in general. I William Zartman is the Jacob Blaustein Distinguished Professor Emeritus of International Organization and Conflict Resolution and former Director of the Conflict Management and African Studies Programs, at the Paul H. Nitze School of Advanced International Studies, Johns Hopkins University, Washington, DC. He is a member of the Steering Committee of the Processes of International Negotiation (PIN) Program at the International Institute of Applied Systems Analysis (IIASA) in Laxenburg, Austria. He is author/editor of over 20 books on negotiation, conflict and mediation. Guy Olivier Faure is Professor of Sociology at the Sorbonne University, Paris I, and a member of the Steering Committee of the Processes of International Negotiation (PIN) Program at the International Institute of Applied Systems Analysis (IIASA) in Laxenburg, Austria. He has served as an advisor to French government on hostage negotiations. Guy Olivier Faure is Professor of Sociology at the Sorbonne University, Paris V, and a member of the Steering Committee of the Processes of International Negotiation (PIN) Program at the International Institute of Applied Systems Analysis (IIASA) in Laxenburg, Austria. He has served as an advisor on hostage negotiations. He has authored and co-authored fifteen books on negotiation and conflict resolution. His works have been translated into twelve languages. I. William Zartman is the Jacob Blaustein Distinguished Professor Emeritus of International Organization and Conflict Resolution and former Director of the Conflict Management and African Studies Programs, at the Paul H. Nitze School of Advanced International Studies, Johns Hopkins University, Washington, DC. He is a member of the Steering Committee of the Processes of International Negotiation (PIN) Program at the International Institute of Applied Systems Analysis (IIASA) in Laxenburg, Austria. He is author or editor of over twenty books on negotiation, conflict, and mediation.